As I’ve started traveling more frequently I’ve also started to get the hang of how to find the best deals on rental cars. I’ve learned about the different fees and taxes imposed by various cities, about which car rental companies I prefer renting from, and about how much the prices can fluctuate even from one hour to the next. The best thing about car rental prices is that reservations oftentimes can be cancelled and re-booked with no change fees, and in most cases your credit card doesn’t get charged until you pick-up the car. In comparison to hotel or flight reservations, car reservations offer amazing flexibility. It can be a bit monotonous to check the prices over and over again but I’ve managed to snag some amazing prices on car rentals just by checking once or twice a day over a couple of weeks. I haven’t found that a particular time (late at night, afternoon, weekdays, whatever) is the magic time for discounts so I just try to check at different times of the day. It’s fairly quick and painless to check the prices and I usually do so with my browser in “private mode” to avoid cookies. One of my co-workers recently taught me the art of always checking car rental prices in the last day or two before a trip. Sometimes companies will drop their prices significantly right before a weekend if they have a lot of availability. My already cheap $40 car rental for a weekend in California became $25 when I checked the prices 24 hours before the trip and re-booked at the lower price. Alamo & National are my favorite but I recommend joining the loyalty program for any company that you end up renting from. You often get an immediate benefit for being a member, and even if you don’t, you can usually accrue rentals towards earning a free day. Same concept as Starbucks and their gold stars for those of you who do that. Alamo gives members 5% off automatically, and National has their Emerald Aisle which allows you to pick any car you want while only paying the midsize car price. Both programs are free loyalty programs so there’s no reason not to utilize them. I’ve also found that being on the email lists for National and Alamo has gained me some valuable discount codes that I’ve been able to use on multiple occasions. National sent me a discount code for a free day when I initially signed up for theirs. Some people have AAA and other travel discounts but the one membership I have that’s helped me with rental cars is actually Costco. They have a car rental website and on quite a few occasions I’ve found the best rate by booking through Costco. I’ve had multiple situations where tweaking the pick-up or drop-off time by 60 or even just 30 minutes has changed the overall price drastically. The biggest thing that I try to watch for is avoiding just barely going over a 24 hour period. So for example, instead of needing 3 days and 1 hour for the rental, if I make it 2 days and 23 hours, the price might drop since it’s under the 3 day mark. Obviously you have to do what works with your flights if you’re dealing with those but it’s worth trying. If you need to shave a half an hour off somewhere try pushing back your pick-up time by 30 minutes. If your flight gets delayed it won’t make a difference, and if you do get there on time they usually won’t worry about the extra half hour at that point. One weird example I had of this is when I was booking a bunch of cars for a trip I was organizing that involved over 30 people. One of the other drivers was attempting to book their car and was putting in midnight as the pick-up time on Costco’s car rental search. The company that I was finding the cheap rate at apparently closed at midnight (which I think was actually an error as all the other counters in the shared facility were open past midnight) so when I was searching for 11:30 PM I was seeing it but the other driver was not when he searched for a midnight pick-up. The group was able to get to the car rental place before midnight, and even if they hadn’t I still think they would have been fine. But the majority of the time it’s about the length of the reservation. Here’s my most recent example of how time tweaking made a difference. I was looking at rental prices in Manchester (my first international car rental!) and plugged in some estimated times. The pick-up time is based on when my flight would land and the drop-off time was something I somewhat randomly selected. I was planning on taking a train to another city on that day I could be flexible about what time I did so. A $40 savings just for being willing to return the car a bit earlier! I also moved the pick-up time back a half an hour because I realized that with going through customs I probably wouldn’t get to the car rental place that quickly anyway. Different people have different opinions about how much insurance you need. I always tell people that the most important thing is knowing what your personal car insurance covers and/or what your credit cards provide for you with insurance. There’s no reason to pay for coverage that you already have. If you really feel like you need to purchase extra insurance, it’s probably worthwhile to research third party insurance rather than taking what’s offered from the car rental company themselves. I always forgo extra insurance coverage when I’m renting a car in the US because my personal car insurance covers me. I also have a couple of travel credit cards that include insurance. In fact, I turn down just about anything a car rental company tries to sell me since it’s almost always overpriced! What about you guys? 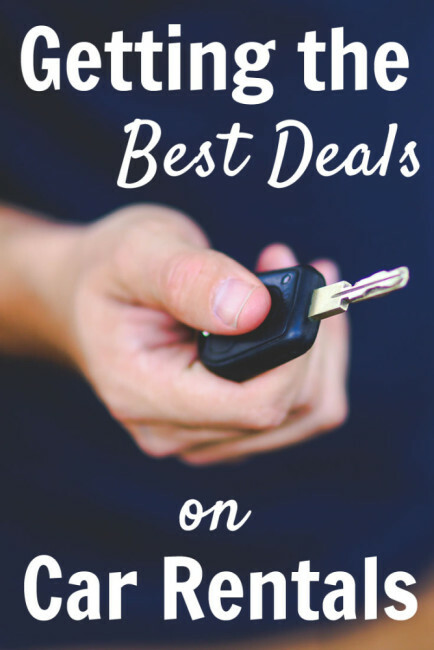 What tips do you have for getting the best deal on car rentals? These are really smart tips! 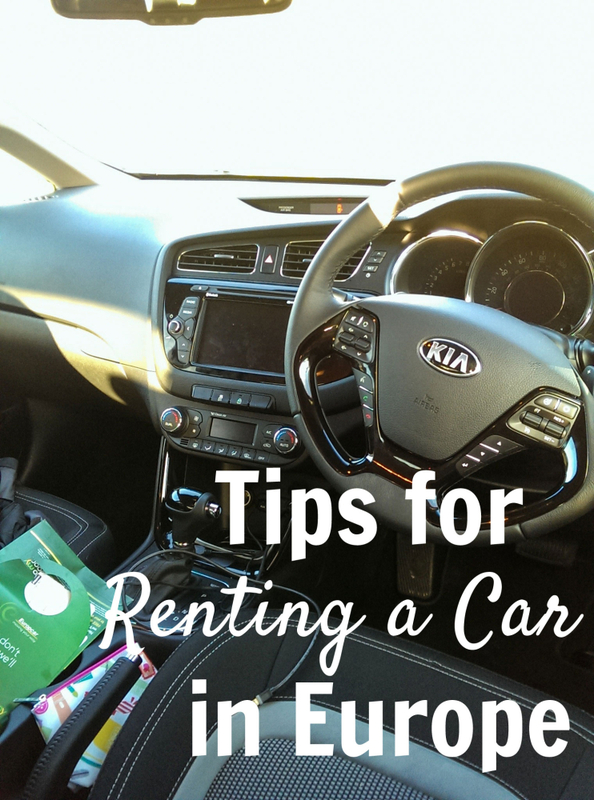 I’ve always avoided renting a car because I knew it would be more expensive before I was 25. Now, I might try it sometime! I had no idea there were so many ways to get a better deal. I’m pinning this to remember for the future. Enterprise will rent to you if you are over 21 without an extra fee! :) My husband works for them! Awesome tips! I’ve never thought of adjusting the time by just an hour or so either way to try to get a lower rate. I agree that it’s pretty much never worth paying for the extras. As long as you know your own car insurance will cover you, there’s not much point to it. Another of my favorite strategies is to select a lower vehicle class. Almost every time I get to the rental counter, they’re out of what I selected and upgrade me to a higher level for free! My husband works for Enterprise Rent-A-Car and they are the parent company to Alamo and National. It’s crazy how much I’ve learned about rental cars since he started working for them over a year and a half ago. A lot of your tips are spot on! Enterprise will offer to beat ANY price quote by 5% if you bring in a print out of what the quote was from a different company. Also, it is super important to make sure your rental car is insured by your insurance because a lot of his customers decline the insurance options without checking and even a simple windshield crack or rock chip will come back to them. 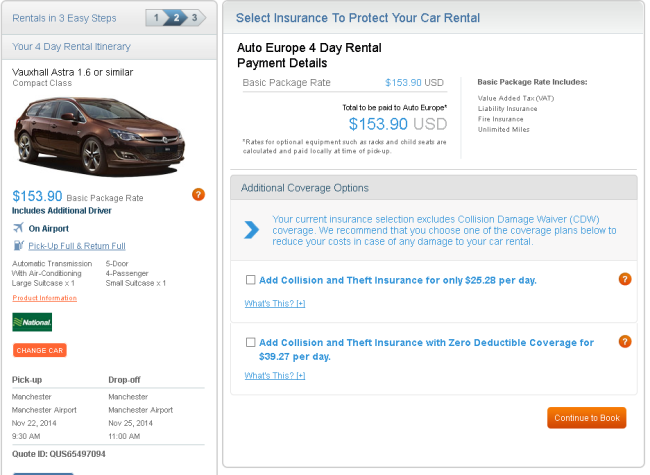 Some car rental insurance plans may be expensive, by Enterprise is 18 dollars a day with no deductible. Even with regular insurance coverage, it may be smarter to spend the 18 bucks a day for three days instead of risking having to pay a 500 dollar deductible. While Dustin loves his job, many customers treat him like a human vending machine and he often comes home feeling really down because some people don’t get their way and take it out on him. It’s important to remember that car rental employees are doing their best and they shouldn’t be treated poorly! Hey Chelsie! Sorry for the late reply on my part. Your point about treating rental car employees with some grace is so important! I think that traveling tends to make people tense and I think it’s worthwhile to take a deep breath and think about what’s really happening before you take it out on an innocent employee. And I didn’t know about Enterprise beating other quotes by 5% – that’s great to know! Great post!! I’m saving this to reference for our next trip where we need to rent a car! Ah that means a lot!! :) I’ve been working 65-80 hour work weeks, so I just have not had the time and energy to post. I’m hoping to come back soon – probably in April. I miss it so much! I love all of your tips. I agree with you that Costco often has some of the best rates for rental cars. We’ve found that too. Pinning this!